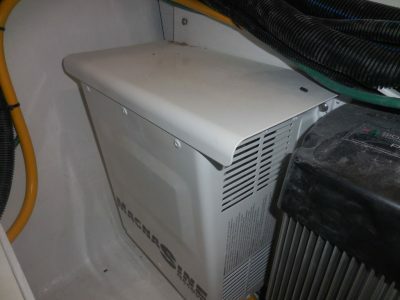 This manufacturer-supplied drip shield enables this inverter/charger to meet the guidelines set forth in ABYC A-31. 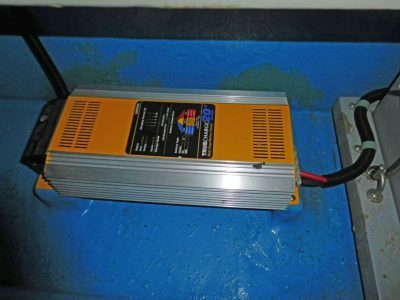 Several years ago I became aware of the American Boat & Yacht Council’s (ABYC’s) requirement for drip protection in Chapter A-31, “Battery Chargers and Inverters.” Section 31.5.5.2.1 states that chargers and inverter/chargers shall be installed “in a ventilated, dry, accessible location,” while 31.5.5.5 dictates that “physical protection from falling objects or drippage shall be provided unless such provision is integral to the unit” (italics mine). And, 31.5.5.3.4 adds still more, saying that a charger and/or inverter “be mounted at least 24” (0.6m) above normal accumulation of bilge water, or protected so it is not subject to bilge splash.” I must confess, before reading this I simply assumed that manufacturers of marine battery chargers and inverters built in protection from that virtually inevitable onboard phenomenon, dripping water. That is decidedly not so: all one has to do is look at the gaps and holes in the tops and sides of many of these components. Other than these obvious water-ingress avenues, how is one to know if a particular piece of gear is protected from dripping water, or if an external deflector is required? (Note that A-31 also calls for chargers to meet UL 1236, which includes drip-resistance requirements; therefore, a charger that complies with UL 1236 should, in theory, be protected from dripping water. If your eyes tell you otherwise, then you should be suspicious.) Enter the IP Code, or International Protection Marking System, often (logically) referred to as “Ingress Protection.” While it’s not referenced specifically in ABYC A-31, the standard, published by the International Electrotechnical Commission (IEC), provides those who select and use this gear with an indication of resistance to access through the chassis, as well as resistance to water. The two-number IP code system is in widespread use and covers everything from simple junction boxes to cell phones. You’ve almost certainly seen—and probably ignored, as I initially did—these numbers when perusing installation manuals and online specifications. Here’s how it works: The first numeral (0-6) essentially specifies the size of the largest object that could fit through openings or gaps in the component’s enclosure, starting at no protection against ingress, i.e., an open, unenclosed device (0), to openings that would allow the back of a hand (1), fingers (2), tools and wires (3), insects (4), and ultimately, dust-tight (6). This charger installation is doubly challenged: it’s mounted low, close to potential bilgewater, and it lacks protection from overhead drippage. The second numeral (0-9) is where it gets interesting. Starting again with no protection against harmful ingress of water (0), then moving up to resistance to vertically dripping water (1), dripping water when the device is tilted up to 15° (2), spraying water (3), and the highest rating, being able to resist a powerful jet of high-temperature water (9K). See the tables below for specific details, including the duration of these tests. 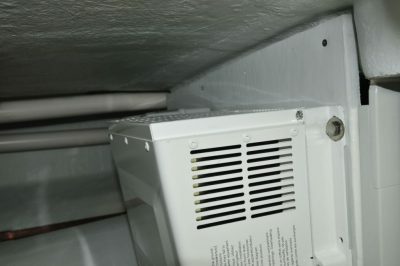 While this isn’t part of the ABYC Standard, the IP code system can serve as a guideline for installers who are attempting to comply with A-31. If no IP code is present, then you’ll have to follow your judgment and the manufacturer’s written descriptions. If clear openings are present in the top or upward-facing surfaces—and, in some cases, sides (a hole in the side of an enclosure could potentially admit water, while a louver may shed it)—then clearly the component, out of the box, is not compliant. Given my druthers where IP ratings for chargers and inverters are concerned, I’d like them to meet IP 22 or 32. 0 — No protection against contact and ingress of objects. 1 >50mm Any large surface of the body, such as the back of a hand, but no protection against deliberate contact with a body part. 4 >1mm Most wires, slender screws, ants, etc. 6 Dust-tight No ingress of dust; complete protection against contact (dust-tight). A vacuum must be applied. Test duration of up to 8 hours based on airflow. Tested with the lowest point of the enclosure 1,000mm (39”) below the surface of the water, or the highest point 150mm (6”) below the surface, whichever is deeper. 9K Powerful high-temperature water jets Protected against close-range high-pressure, high-temperature spray downs. Smaller specimens rotate slowly on a turntable; larger specimens are tested freehand for a longer time. Smaller specimens are tested from 4 specific angles. While uncommon, drip shields like the one shown here that are unobtrusive, inexpensive, and readily available offer invaluable protection against water damage. If you find that a component lacks an IP rating or is otherwise not compliant with ABYC A-31, all is not lost. You can install a relatively simple “rain shield” over the component. Sometimes these are available from manufacturers as accessories. 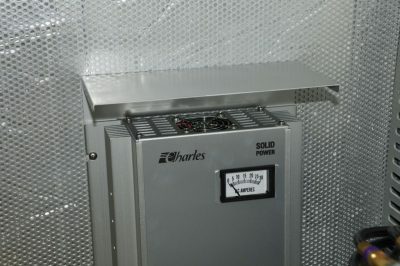 If made in-house, this will be no more than a section of a metallic or acrylic sheet (the latter is flammable and could pose a fire hazard in the event the charger or inverter overheats or catches fire; many inverter and charger manufacturers call for installation on noncombustible surfaces, and all manufacturer-supplied hoods I’ve encountered are metallic). It should be ideally up to an angle of 15° (the angle is my recommendation; it’s not specifically mentioned in the ABYC Standard). And it should prevent water from running behind the gear, so the mounting flange may require bedding. When it comes to protection from bilgewater, obviously these units should be mounted well above (18”/0.5m or more) the level of water that would trigger a bilge pump. On a couple occasions I’ve seen chargers, inverter/chargers, and power converters being “showered” by leaking stuffing boxes while under way. Mounting these components in the path of a leaking packing gland is simply unwise and should be avoided. Many enclosures are equipped with openings to provide ventilation in both the top and sides. While beneficial for heat dissipation, they are avenues for water ingress in the absence of a drip shield. While I’ve called out chargers and inverter/chargers, primarily because they are specifically mentioned in ABYC A-31, my recommendations apply elsewhere as well. For instance, ABYC E-11.14.4.1.1 states: “Junction boxes, cabinets, and other enclosures in which electrical connections are made shall be weatherproof, or installed in a protected location [hopefully, most boatbuilders and installers rely on the latter, unless the location is exposed to weather or bilgewater], to minimize the entrance or accumulation of moisture or water within the boxes, cabinets, or enclosures.” The definition of “weatherproof” according to E-11 is “constructed or protected so that exposure to the weather will not interfere with successful operation under the test conditions specified in NEMA 250, Type 3 or IEC 60529 Type IP 54.” Here, the IP rating is noted, which removes doubt and the need for interpretation. Careful consideration should always be given to installation locations and drip protection for chargers and inverter/chargers, as well as for all electrical gear including transformers, converters, and junction boxes.